Unsupervised Blue Whale Call Detection Using Multiple Time-Frequency Features Alejandro Cuevas, Alejandro Veragua, Sonia Español, Gustavo Chiang y Felipe Tobar. Proceedings of IEEE Chilecon 2017. Cade, A. Friedlaender, J. Calambokidis, J. Goldbogen. Kinematic Diversity in Rorqual Whale Feeding Mechanisms. October 2016 Current Biology, Volume 26 (1-8). Jara, R. Barra and W. Espejo, J. Celis and D. González, G. Chiang, J. Sánchez. Persistent organic pollutants and porphyrin levels in excreta of penguin colonies from the Antarctic Peninsula área. September 2016. Polar Record. W. Durban, M. J. Moore, G. Chiang, L. S. Hickmott, A. Bocconcelli, G. Howes and P. A. Bahamonde, W. L. Perryman, D. J. Leroi Photogrammetry of blue whales with an unmanned hexacopter 2016. Marine Mammal Science. Bocconcelli, L. Hickmontt, G. Chiang, P. Bahamonde, F. Caruso, M. Saddler, L. Sayigh. 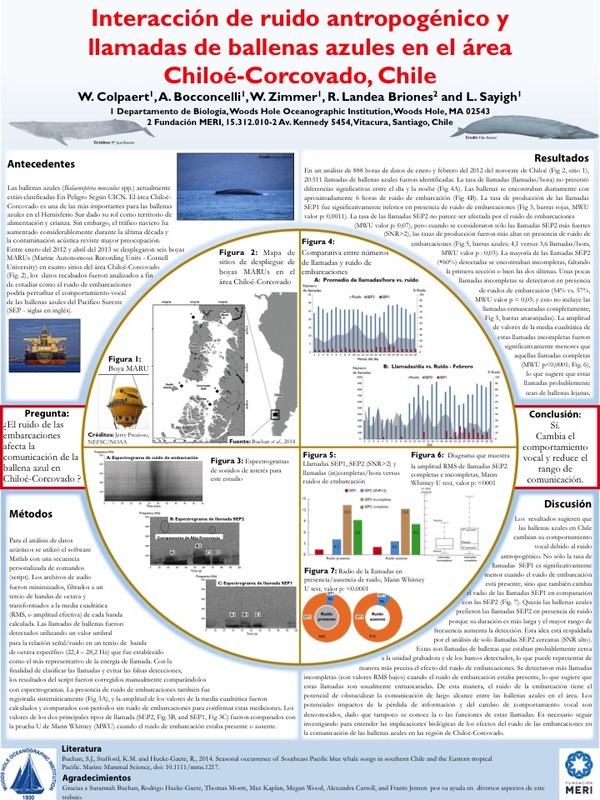 DTAG studies of blue whales (Balaenoptera musculus) in the Gulf of Corcovado, Chile. 10-16 July 2016. Volume 27. Rudolph, G. Chiang, C. Galbán-Malagón, R. Mendoza, M. Martinez, C. Gonzalez, J. Becerra, M.R. Servos, K.R. Munkittrick, R. Barra. Organic pollutants and porphyrins biomarkers in penguin faeces from Kopaitic Island and Antarctic Peninsula. 2016 Science of the Total Environment. Blue whales of the Chiloé-Corcovado region, Chile: Potential for anthropogenic noise impacts Wouter Colpaert, Rafaela Landea, Gustavo Chiang, Laela Sayigh. Proceedings of Meetings on Acoustics. 2016. Jara-Carrasco, M. González, D. González-Acuña, G. Chiang, J. Celis, W. Espejo, P. Mattatall and R. Barra. Potential immunohaematological effects of persistent organic pollutants on chinstrap penguin. 2015. Antarctic Science 27 (04): 373-381. Barra, M. Díaz-Jaramillo, M. Rivas, P. Bahamondea, K R. Munkittrick. Estrogenicity and intersex in juvenile rainbow trout (Oncorhynchus mykiss) exposed to Pine/Eucalyptus pulp and paper production effluent in Chile. 2015 Aquatic Toxicology. Chiang. Estrogenicity and intersex in juvenile rainbow trout oncorhynchus mykiss exposed to pine eucalyptus pulp and paper production effluent in Chile. 2015. Chiang, K.R. Munkittrick, Mark E. Mcmaster, R. Barra and M. Servos. Regional Cumulative Effects Monitoring Framework: Gaps and Challenges for the Biobío River Basin in South Central Chile. 2014. Gayana 78(2): 109-119. Caruso, A. Bocconcelli, G. Chiang, L. Hickmott, and L. Sayigh. Acoustic behavior of blue whales (Balaenoptera musculus) in the Gulf of Corcovado, Chile, recorded on DTAGs. 2016. Colpaert, A. Bocconcelli, W. Zimmer1, R. Landea Briones and L. Sayigh Interacción de ruido antropogénico y llamadas de ballenas azules en el área Chiloé-Corcovado, Chile. 2016. Wood, G. Howes, R. Landea, A. Carroll, A. Bocconcellil, L. Sayigh. Ver lo no visto: estudiando la diversidad, distribución y estacionalidad de ballenas en la costa de Chiloé-Corcovado mediante boyas de monitoreo acústico pasivo. 2016. W. Durban, M. Moore, G. Chiang, L. S. Hickmott, A. Bocconcelli, G. Howes, P. A. Bahamonde, W. L. Perryman, D. J. Leroi Fotogrametría de ballenas azules por medio de un hexacóptero. 2016. Bocconcelli,M. Saddler, L. Hickmott, G. Chiang, P. Bahamonde, F. Caruso, & L. Sayigh. Acoustic behavior of blue whales (Balaenoptera musculus) in the Gulf of Corcovado, Chile, recorded on DTAGs. 2016. Colpaert, A. Bocconcelli, W. Zimmer, R. Landea Briones, G. Chiang, and L. Sayigh. Potential effects of anthropogenic noise on blue whale calling behavior in the Chiloé-Corcovado region, Chile. 2015. Chiang, K. A. Kidd, N. J. O’Driscoll, S. Jara, M. Diaz-Jaramillo and K.R. Munkittrick. Mercury biomagni‑cation in a Chilean Patagonian marine foodweb: preliminary results. 2014. Wood, R. Landea Briones, A. Carroll, A. Bocconcellil, L Sayigh. Seasonality and distribution of baleen whales in the Chiloe-Corcovado region, Chile, using passive acoustic monitoring. Wood, R. Landea Briones, A. Carroll, L. Sayigh. Utilizing passive acoustic monitoring to study baleen whale diversity, distribution, and seasonality off the coast of Chile. Colpaert, R. Landea and L. Sayigh. Anthropogenic noise and blue whales in the Gulf of Corcovado, Chile. Chiang, K.A. Kidd, N.J. O Driscoll, S. Jara, M. Diaz-Jaramillo and K.R. Munkittrick. Feathers, faeces and skin biopsies as non-lethal samples for mercury in marine predators from Cape Shirre and Paradise Bay, Antarctic Peninsula. Bocconcelli, M. Moore, J. Durban, L. Hickmott, G. Chiang, G. Howes, P. Bahamonde and L. Sayigh. 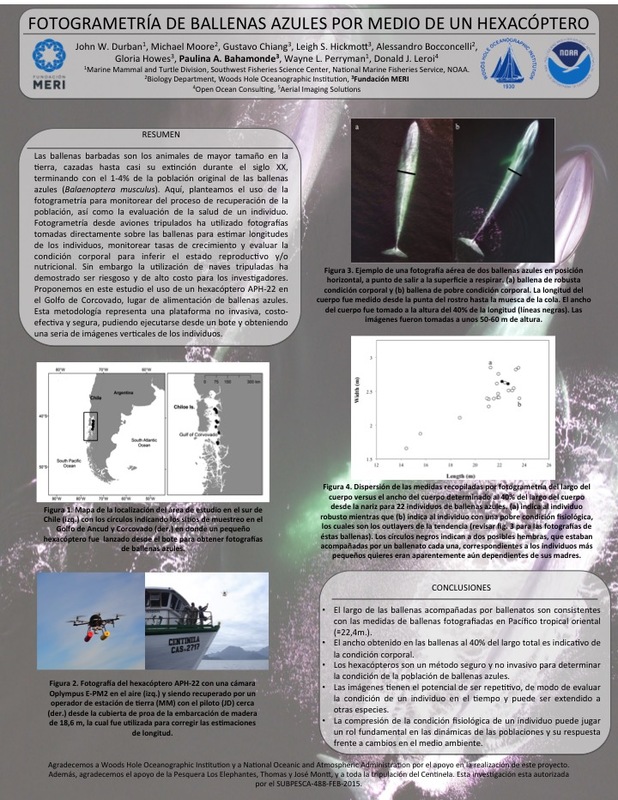 Investigating the ecology and behavior of blue whales (Balaenoptera musculus) in the Gulf of Corcovado, Chile 2015. Bocconcelli, L. Hickmott, R. Landea Briones, G. Howes y L. Sayigh. 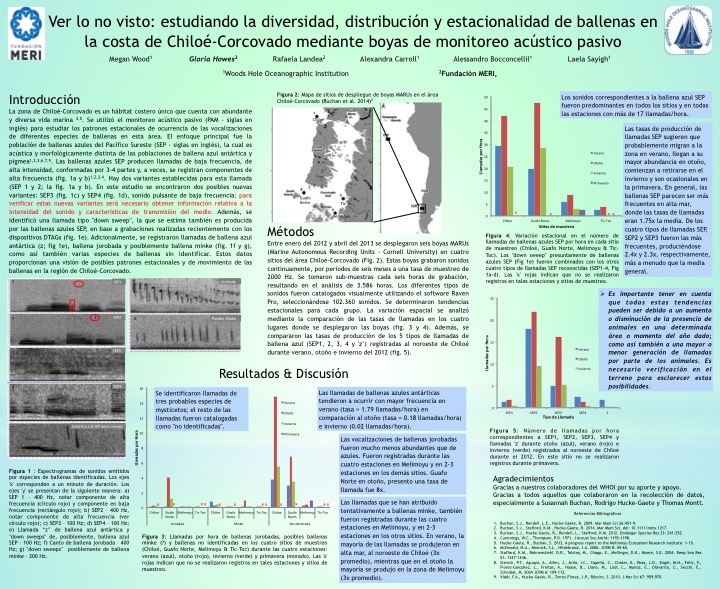 Investigación preliminar sobre la ecología y comportamiento de las ballenas azules (Balaenoptera musculus) en el Golfo de Corcovado, Chile. 1 Septiembre 2014. Bocconcelli, L. Hickmott, R. Landea Briones, G. Howes & L. Sayigh. A preliminary investigation into the ecology and behavior of blue whales (Balaenoptera musculus) in the Gulf of Corcovado, Chile. 1 September 2014.